Asthma is a medical condition which is caused by the narrowing of the bronchial tubes in the respiratory system. This narrowing is generally caused by an inflammation due to allergic reaction or infection. Asthma can be hereditary but can also depend on an individual’s constitution. 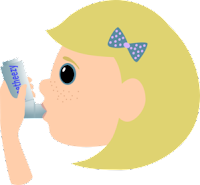 General symptoms of Asthma are wheezing, coughing, shortness of breath at night or on exertion, violent coughing and tightness in the chest. In Yoga, it is said that an Asthmatic patient generally has weak exhalation. Hence they are made to do more of breathing exercises to improve their exhalation. Asthma is a physiological condition but it can be triggered by emotional imbalance. Other triggers are allergens in food or air or certain irritants in the environment, like the presence of a pet, pollen, toxic fumes from paint on the walls, dust, unclean carpets, etc. It is said that Asthma has no cure. The inhalers and steroids invented by modern medicine help in opening up the air passages during an attack. But how to prevent it? Yoga and Alternative Therapies like Reflexology help in preventing attack and maintaining good health. Pranayamas and Kriyas taught in Yoga help to improve the breathing capacity as well as strengthen immunity. Kriyas like Jalneti especially help in preventing infection that can easily trigger attacks. Yoga also helps in keeping a balanced state of mind which, when achieved helps keep emotions in check. This helps prevent attacks due to causes like anxiety, stress and emotional distress. Reflexology is known for its relaxing and stimulating effect. The warm-up techniques, especially the lung press, upward thumb friction on the soles of the feet as well as massaging between the metatarsals on the upper surface of the feet help to relax the patient and triggers slower, deeper respiration. The main areas to focus on in Reflexology are the Nervous System, the Respiratory System and the Lymphatic System. The Nervous System helps stimulate better nerve function and will keep the person calm and relaxed. The Respiratory System obviously needs to be worked on as it is the main system that gets affected. Thumb/ finger walking and pivoting can be done on the lung area on the sole as well as the upper surface of the feet, the nasal passage and sinuses are also the areas to focus on. Working on the Lymphatic System helps improve immunity and remove stress. Reflexology is especially effective on children. They immediately begin to relax, their breathing slows down and they also fall asleep almost immediately. It has been found that Reflexology triggers overall healing, not just in the body, but also the mind and the spirit. Pristine Senses Academy conducted the first of a series of FREE demonstration seminars on healing therapies and natural home-made products on Wednesday 16th May, 2012 at Goregaon, Mumbai. These seminars are targeted at all women, whether they be professionals, therapists, beauticians or home-makers. The purpose of these seminars is to increase awareness about alternative healing therapies and how they can help the common man remain healthy and stress free. The seminar was a great success with a group of women of all ages and occupations having an interactive and enlightening session. Among the topics discussed were the need for natural living and alternative therapies in this day and age, the harmful effects of chemicals present in cosmetics, beauty and health products, the need to use natural home-made products devoid of artificial colorants and fragrances and the importance of research and information on all things we consume. Each of the women had a chance of experiencing different therapies during the demonstration and we received enthusiastic and positive feedback at the end of the seminar. We at Pristine Senses Academy hope to continue spreading awareness and knowledge on health and wellbeing in society. After all, it is said that if we educate the woman of the house, we educate the entire family.